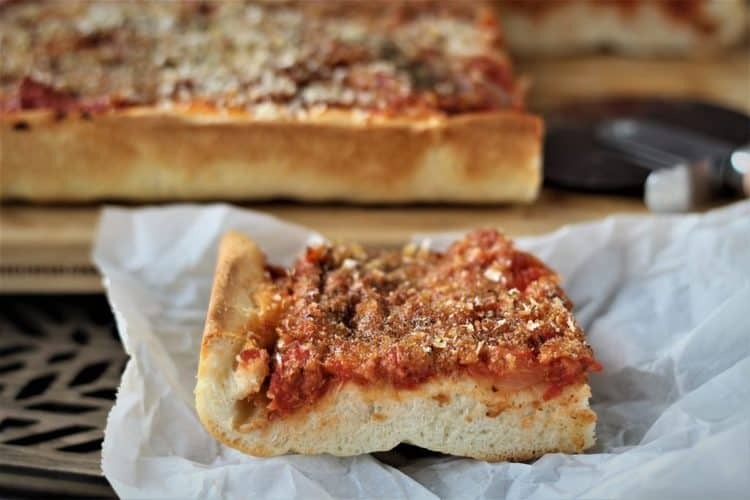 Sfincione Siciliano is a Sicilian style pizza unlike any other you’ve tried before. Topped with crispy bread crumbs and grated cheese for a satisfying crunch with every bite! Let’s talk about Sfincione Siciliano or sfinciuni as it is referred to in the Sicilian dialect. Have you ever heard of it? Neither have I until recently. But Sfincione Siciliano looks just like pizza! You might say it looks just like pizza. In fact I refer to it as Sicilian style pizza but I know some Sicilians may not agree with that. You see, Italians can be very particular about the authenticity of their recipes. 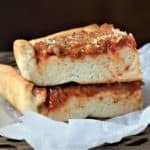 Sfincione Siciliano is a Sicilian style pizza with a thicker crust (just like a focaccia) and is baked in rectangular shaped pans. I have already shared with you my recipe for Black Olive Focaccia . The sfincione dough is usually covered with anchovies preserved in oil. However, you’ll notice that I did not include any in my recipe. This is due to a strong dislike of anchovies in my home! The anchovies (if using) are covered with a delicious tomato sauce with lots of onions and oregano. 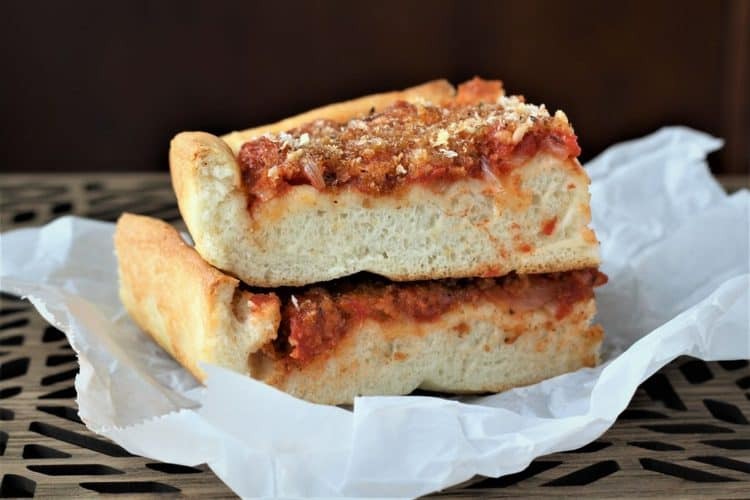 Lastly, the sauce is topped with either shredded aged caciocavallo cheese or grated pecorino cheese as well as a crispy, lightly toasted breadcrumbs. I opted for the pecorino cheese and I am pleased with the result. You can practically say it makes this pizza lighter! Believe me, this is unlike any other pizza you’ve had before. That crispy breadcrumb topping provides you with a satisfying crunch with every bite! I’ve probably eaten Sfincione all my life! I realize that I’ve been eating some form of sfincione since I was born. Raised in Montreal, I’m used to the thick crusted, rectangular shaped, tomato covered pizza that is common in all Italian bakeries. I think perhaps this pizza evolved from sfincione? On sfincione, the crisp breadcrumb coating absorbs some of the tomato sauce thus preventing it from becoming greasy and overly saucy. You know what I’m talking about! My mother has always made, and still makes, a similar homemade version with mozzarella and whatever toppings we were into at the moment. I have never tasted an authentic sfincione from Sicily but without a doubt I will before this year is over. Nonetheless, my kids and I are quite pleased with this version. But I’ll let you know in a few months how it compares to a true Sicilian baked sfincione! Until then I will continue to enjoy my own homemade sfincione and I hope you decide to give it a try as well. If you do, please tag me with your photos on Facebook or Instagram with @manigabedda or #mangiabedda. Don’t forget to pin the recipe for later! Buon appetito! 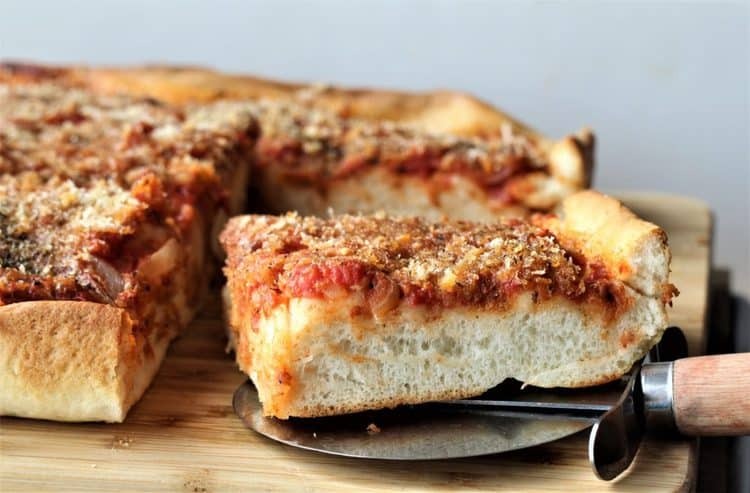 Sfincione Siciliano is a Sicilian style pizza which differs from your usual pizza as it is coated with a layer of crisp breadcrumbs. A delicious alternative to your typical cheese covered pizza and definitely a must-try! In a small sauce pan, warm the water until tepid. Place the yeast in a small bowl and cover with warmed water. Let sit for 10 minutes to proof. In the bowl of a stand mixer fitted with a dough hook, combine the flour and salt. When the yeast has proofed, stir in the olive oil and sugar. With the mixer running on low, pour the yeast mixture into the flour. Mix until combined. Meanwhile prepare the toppings. Toast the bread crumbs in a dry pan on medium heat until lightly browned, about two minutes. Set aside. Heat olive oil in a medium sized skillet and sauté the onions until golden, about five minutes. Stir in the minced garlic and cook two minutes longer. Add the peeled tomatoes and break them apart with a wooden spoon. Stir in the oregano and salt, to taste. Lower to a simmer and cook for 30 minutes. When the dough has risen, oil a 10x16 inch baking pan generously. Using your finger tips, stretch out the dough to cover the entire pan. Cover and let sit 30 minutes. Preheat oven to 425F. If using, distribute anchovy fillets evenly over the dough. Cover with the prepared tomato sauce. Sprinkle the grated cheese over the sauce, then cover with toasted breadcrumbs. Sprinkle the remaining oregano and lightly drizzle with olive oil. Bake for 25 minutes until the bottom is browned. Cut into squares and serve hot or cold. Sfincione Siciliano can be frozen once baked. Wrap tightly with plastic wrap prior to freezing. Defrost in the refrigerator and place in the oven to warm before serving. Please note that the nutritional information provided may vary according to exact portion size. Thank you for posting this recipe. Since my mom got sick, I’ve been wanting to make this, but so afraid it wouldn’t be like her’s. I think I’ll try now. You’re welcome Tina, hope you give it a try and please let me know how it turns out. Sending you positive vibes for your mother! Thank you for sharing such sacred family recipes. I just prayed for her and you and will honor these recipes that you have so kindly shared. God bless you. Brenda DiCocco. Hi Brenda, thank you very much for your kind comment! It is my mission to preserve these precious recipes that would otherwise be lost one day and I'm so glad to hear that you appreciate this as well. Have a great day! Love reading your recipes and hearing about your mother's experiences. Makes me think of my grandmother. She was from Sicily and has been been with our Lord for some time now. She always made the cuccidati at Christmas and has become a favorite of the family's since as far back as I can remember. I don't ever recall her making the pignolata but my next door neighbor from Italy did and always sent us over some. Our family always tries to do the cuccidati and they come out fine, but not like hers. But we at lest have the memories of hers and her little coffee pot she always made her coffee in. I may just give pignolata a try. Thanks for sharing. Hi Arlene, thank you so much I appreciate your kind words! It's interesting to see how much Sicilian cuisine varies from one province to another. For example, my family has never made cuccidati but I have tasted them and they're wonderful. In my family, my aunt made pignolata each year for Christmas. Unfortunately we did not get the recipe from her before she passed away and so this recipe came from my cousin in Sicily. Hope you enjoy it, let me kow how it turns out! Hi! I've grown up eating this as our Christmas tradition. My grandpa makes it every year! I tried your dough recipe twice but I think I am doing something wrong. Please help! My crust is bubbling and turns out very tall instead of flat and dense as it should be, and like your photos. The edges end up huge! How can I fix this? Hi Domenica, by your description it sounds quite good! This is a focaccia type dough so it will double and be a bit taller than a regular pizza. However, it may also depend on what size of pan you are using? Perhaps you can try a larger pan so that it will spread out and not become as tall when you bake it. It's hard to say since I have not seen your dough but I hope this can help! Hi Nadia, I have just discovered your website and I love it! There are a few recipes I'd like to try, I was wondering if you have a recipe for stuffed baked eggplant and/or zucchini. Thank you. Hi Maria, thank you, how kind of you! Unfortunately at the moment I don’t have a recipe for those but they’re definitely on my to do list! I do have a recipe for eggplant parmigiana as well as baked eggplant with potatoes in tomato sauce. Thanks for your comment! Hi Maria, how silly of me to forget that I have a recipe for my mom’s best stuffed peppers in the blog as well! Hi Kavita, it's my pleasure! Thanks for stopping by my blog!